Months after the initial announcement of the game, Artifact is resurfacing as it draws closer to a public beta version. Time for the brains behind it to talk about it, as lead designer Richard Garfield and programmer Jeep Barnett did with Eurogamer in an interview. Garfield, the founding father of Magic: the Gathering, says digital card games were on his mind very early on: “I first began thinking about electronic card games basically as soon as Magic came out and we realized how inadequate it was for electronic play.” From there on the design got tinkered on for years. Throughout the initial design phase — which Garfield says is where his strength lies — he visited Valve quite often, though now he’s around once a week. Within the first set what we’re exploring is a big three-way battle between faction. There is the Bronze Legion, the Red Mist, and the Vhouls. The outcomes of what happens in the stories will affect what happens in the next set. It’s a direct appeal to a large group of gamers that love to engage with the world’s design. Games like Hearthstone, GWENT and The Elder Scrolls: Legends all are built on an existing universe and have attracted many players through it. 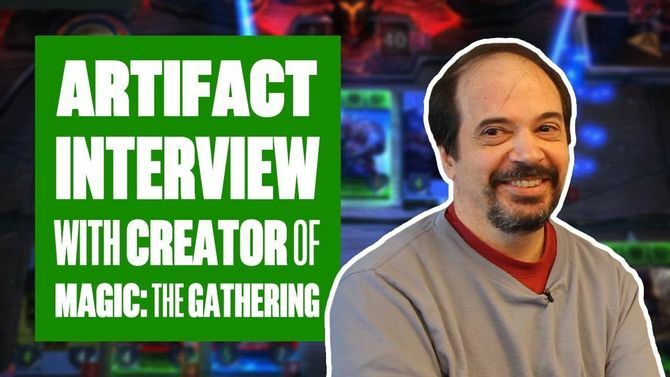 Speaking of Artifact’s direct competitors, Garfield and Barnett shared some thoughts on their game’s relation to Hearthstone too. While acknowledging the strengths Blizzard Entertainment’s card game boasts, they are quick to call out key differences too. “One of the things we were designing Artifact to do is a broader, more open-ended experience.” Garfield adds that people transitioning from Magic: the Gathering to Hearthstone often miss the variety of the former, resulting in the Artifact design to be as boundless as possible. For example: you can have an endless amount of minions on your board if that’s what you want to do. For anything that is randomized, there is a way that you can build your deck to interact with it or control it. It does come at a prize though, as those mitigating tools do take up a slot you could’ve spent on another strong card. We understand what the costs are of the decks that are winning. We don’t want those to be prohibitively expensive. That means that we want a lot of Common cards are generally useful, and that the Rare cards add the final spice. Furthermore, Garfield says that the trading of cards allows for players to move their investment around from one deck to another easily. “You have to avoid this thing where you just kick in money and get a better chance to win. That’s the way a well-designed game in this space works, I think.” The more cards you have do give some extra flexibility at first, but eventually, you can obtain the right cards by trading them, and it all comes down to pure skill then. The full interview can be watched below.